There's nothing like getting advice from a professional, so here is an article written by Antoine Desvallées, tandem paragliding instructor with 'Les Passagers du vent'. Soar over the limestone walls of the Dents de Lanfon and La Tournette, glide above the turquoise waters of the purest alpine lake in Europe and along the ridges of Les Bauges and Les Aravis, built seemingly for the sole purpose of long-distance paragliding. Then land next to the lake, dive in and have a swim before heading of to discover the latest developments in the world of flying sports in the local paragliding schools and boutiques. Annecy and the surrounding area is a paradise for flying sports and is the most popular destination in the Alps for paragliding, for very good reasons. The main take-off points are on the east bank of Lake Annecy: Planfait (altitude 950m) near the village of Talloires and the Col de la Forclaz (altitude 1250m) near the village of Montmin, both of which have breath-taking views. These sites are suitable for both beginners and experienced flyers. On the west bank of the lake, there is a small take-off point near the village of Entrevernes for morning flights. The site is more technical due to its smaller take-off area, cleared amongst the trees. Le Semnoz, the main peak to the west of the lake, has two take-off sites facing the plains for fantastic flights, especially when conditions are too unsettled for flying in higher mountain ranges. Following this slender, westward facing ridge will take you to Le Revard and Le Sire take-off point about 20 miles to the south where you can get back to your starting point without any major technical difficulties. 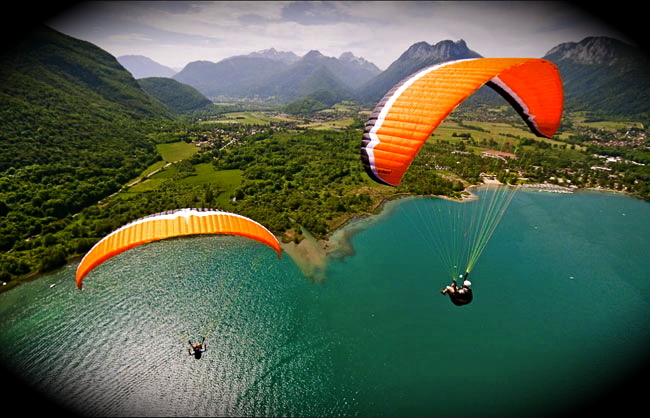 To the south of the lake, Les Bauges Regional Natural Park is a veritable 'flying sports arena'! The range's numerous peaks are all easily accessible and offer a multitude of take-off and landing points among alpine pastures. Before you get started, it is advisable to check the no-fly zones (around the Arcaloz range), as well as the nesting areas to be avoided during certain times of the year. In Les Aravis range to the north-east, there are chairlifts in Le Grand-Bornand and La Clusaz providing easy access to high-altitude take-off points. These sites are particularly enjoyable in summer for flying above the inversion layer and when the lower level air mass is stable. Around Le Bargy and the summit of Le Jalouvre, you might be lucky enough to spot a Bearded Vulture, a majestic bird of prey with a wingspan of over 9 feet. Most of the year, however conditions are better between the end of March and the beginning of October. Inductions, on-site flights, tandem flights with a certified instructor, bivouac flights, cross-country/mountain flights, flights above the lake in specially developed areas with a local paragliding school, winter speed flying in Les Aravis and kite-surfing on Le Semnoz. A network of weather beacons is available on the FVL security radio frequency (French Free Flying Federation 143.9875 Mhz) and on the internet. In an emergency, dial 112 and your call will be transferred to regional emergency services or mountain rescue. Cross-country flyers must be extremely vigilant with Annecy airport close by and must not enter the Terminal Manoeuvring Area to the north of the lake. - A restitution flight in the evening over the Col de la Forclaz. - A short tour around the lake towards the Roc des Bœufs and returning, flying across the width of the lake. - Cross-country flying from Le Semnoz to Le Revard. - Soaring from the summit of Le Tréloz in the morning towards the plains of the village of Ecole-en-Bauges. You can also stay at Antoine's apartment hotel Résidence Florimontane. For more information, find him at: Résidence Florimontane à Talloires. Reserve your flight with Les Passagers du Vent... contact Passagers du Vent.